University of Oklahoma Press, 9780806139128, 194pp. When asked in an interview what he most liked about rodeo, three-time world champion saddle-bronc rider "Cody" Bill Smith said simply, "Horses that buck." Smith redefined the image of America's iconic cowboy. Determined as a boy to escape a miner's life in Montana, he fantasized a life in rodeo and went on to earn thirteen trips to the national finals, becoming one of the greatest of all riders. 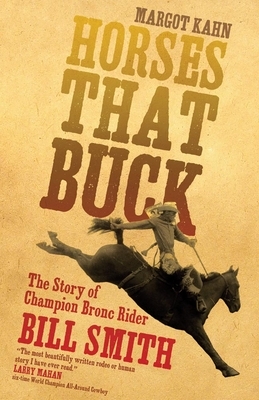 This biography puts readers in the saddle to experience the life of a champion rider in his quest for the gold buckle. Drawing on interviews with Smith and his family and friends, Margot Kahn recreates the days in the late 1960s and early 1970s when rodeo first became a major sports enterprise. She captures the realities of that world: winning enough money to get to the next competition, and competing even when in pain. She also tells how, in his career's second phase, Smith married cowgirl Carole O'Rourke and went into business raising horses, gaining notoriety for his gentle hand with animals and winning acclaim for his and Carole's Circle 7 brand. Inducted into the Pro Rodeo Hall of Fame in 1979 and the National Cowboy & Western Heritage Museum's Rodeo Hall of Fame in 2000, Smith was a legend in his own time. His story is a genuine slice of rodeo life--a life of magic for those good enough to win. This book will delight rodeo and cowboy enthusiasts alike.